It was a momentous occasion for the Hilltop Class of 2017 on Friday, June 9 as they became the 36th eighth grade class to graduate and become Hilltop alumni. More than 100 people gathered on the campus to cheer and celebrate as the Class of 2017 received their diplomas and set forth to begin a new chapter of their lives at their respective high schools. While the graduates celebrated their accomplishments, they also received sound advice from alumna Alexandra Sipols ’13, who shared her experiences and wisdom through her inspiring commencement address. In addition to Sipols’ speech, the graduates reflected on their own experiences, received a variety of academic awards and received well wishes from the faculty and Head of School Peter Gordon. Chloe Clancy, Jessica Wilm and Corrine Wilm were honored with the Perfect Attendance Award, Annele Sipols received the Technology Award, and Corrine Wilm received the Vocal Music Award and the Math Award. The Instrumental Music Award and Science Award were presented to Chloe Clancy, the Art Award to Heather Maxwell, and the English Award to Jessica Wilm. Allyn Perry, chair of the Chinkhewunska Chapter of The Daughter’s of the American Revolution, was on hand to present two special awards sponsored by the DAR. Samuel Wilshinsky was honored with the Excellence in American History Award and Corrine Wilm received the Citizenship Award for exemplifying dependability, leadership, and service. Sisters Jessica and Corrine Wilm were honored with the Academic Excellence Award and Chloe Clancy received the Thomas E. Clancy Memorial Award named in honor of her late father. Established in 2011, the Thomas E. Clancy Memorial Award is given to an eighth grader who over their years at Hilltop developed and showed the skills necessary to initiate and take action to make an idea or project happen, someone who has been motivated to make a positive change at Hilltop or in the community, and has accepted a personal challenge to lead and inspire others. Two additional awards were bestowed on non-eighth graders: the Hawk Spirit Award was presented to Fifth Grader Antonio Puopolo for best exemplifying outstanding school spirit and consistently demonstrating the qualities of friendship, cooperation and genuine excitement for Hilltop. The Core Values Award was presented to Fifth Grader Andrew Antunes for possessing the qualities of honesty, respect, responsibility, and kindness- Hilltop’s Core Calues. The recipient of this award has consistently displayed these core values each day and threaded them throughout their interactions with their peers and faculty alike. In addition, the recipient has made significant contributions to bettering the Hilltop Community and has exhibited excellent citizenship at Hilltop. 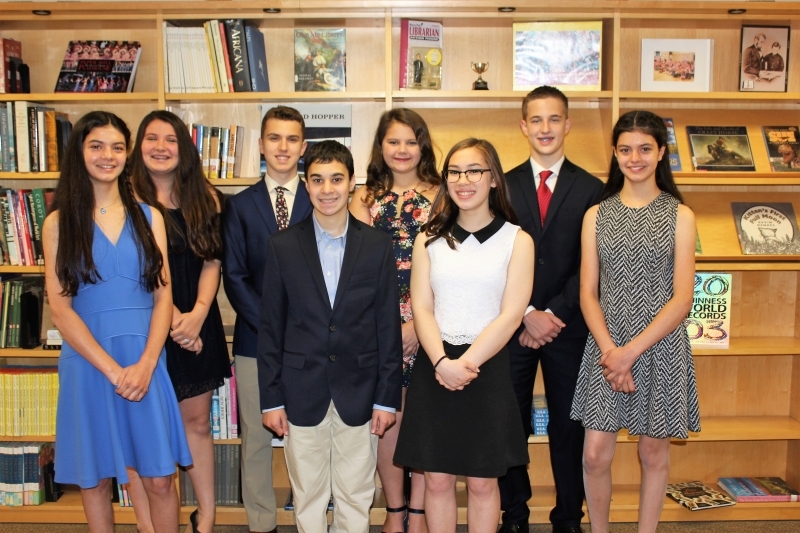 Hilltop congratulates the Class of 2017: Chloe Clancy of Oak Ridge; Ozzy DeLuca of Hardyston; James LaFratte of Oak Ridge; Heather Maxwell of Sparta; Annele Sipols of Sparta; Corrine Wilm of Newton; Jessica Wilm of Newton; and Samuel Wilshinsky of Milford, Pa. The Class of 2017 prior to the ceremony.